*To order quantities in EACHES, please call us at 800-277-3727. These flexible and yet durable water pouches provide a 72-hour supply of emergency drinking water per person. Each 4.2 ounce water pouch is U.S. Coast Guard Approved to store safely for up to 5 years even when stored in extreme conditions. Can be frozen without harm to pouch and used as a "cold pack." Why do you need to store emergency water? Following a disaster, potable drinking water may be unavailable due to several factors. Electricity outages can result in water treatment plants malfunctioning causing tap water to become unsafe for consumption. Emergency responders may not be able to safely deliver water to your area and broken gas lines and power outages may prevent boiling water over a stove top. Ensure you and your familiy's self-reliancy by storing at least a 72-hour supply of water per person. Dimensions: (1) 6-Pack of Water Pouches: 6.75 x 3.25 x .25"
Can be frozen and used as a "cold pack." Instructions: Recommended consumption is 2 water pouches per day (minimal survival supply). 6 pouches of ER™ Emergency Water are the minimum recommended water consumption to sustain one individual for 72-hours following a disaster. Each person in the household should have at least 6 designated pouches of water in your emergency supplies. 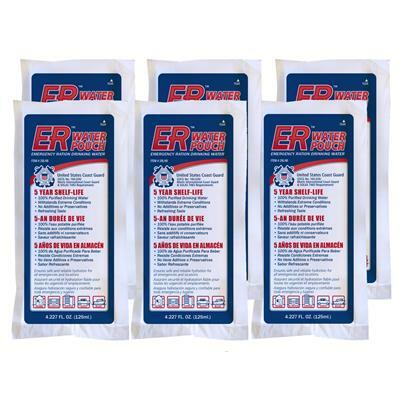 ER™ Water Pouches are certified by the U.S. Coast Guard to store safely for up to 5 years even when exposed to extreme temperature fluctuations. To order additional EA quantities, please call us at 800-277-3727.